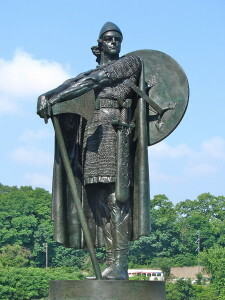 Thorfinn arrived in Greenland in 1002 and married Gudrid, widow of one of the sons of the Norse chieftain Eric the Red. About 1007, Thorfinn sailed with three vessels and 160 men to settle in Vinland, a portion of Newfoundland that had been discovered by Leif Ericsson (probably his brother) about ten years earlier. Thorfinn occupied Vinland for about two years, during which time Gudrid gave birth to the first Euro-American child, a son named Snorro. The colony was, however, abandoned, and Thorfinn returned to Greenland.